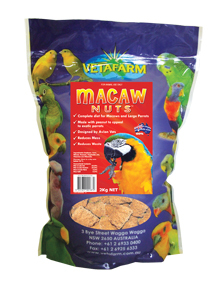 Macaw Nuts is a completely balanced extrusion cooked diet that is designed to meet the specific needs of South American Parrots. 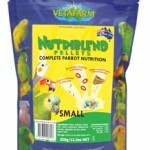 They contains fresh nuts to appeal to exotic parrots and replicate their natural diet. Contains all of the necessary nutrition required for general year round maintenance and increased fatty acids, protein, vitamins and calcium to support egg production, young bird growth and general breeding success. Can use with: Macaw Nuts are complete diets; no additional dietary supplementation is necessary. Fruits and Vegetables can be some behavioral enrichment. Key features: Includes specific amino acids and proteins required by South American Parrots. Completely balanced extrusion cooked diet. Contains fresh nuts to appeal to exotic parrots and replicate their natural diet. Contains all necessary nutrition required for general year round maintenance and increased fatty acids, protein, vitamins and calcium to support egg production, young bird growth and general breeding success. South American birds have specific dietary requirements, which are satisfied by the total diet provided in Macaw Nuts. Their protein and amino acid requirements are balanced with the need for adequate fat and ample antioxidants. 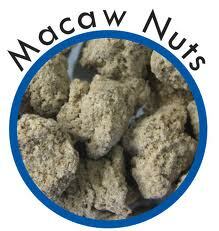 Macaw Nuts should be used as a balanced addition to seed and fruit diets. 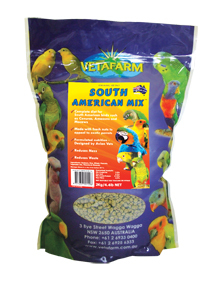 Macaws, Amazons and Conures, Sulphur crested cockatoo’s also suitable for African Greys, Eclectus, Australian and Asiatic Parrots. 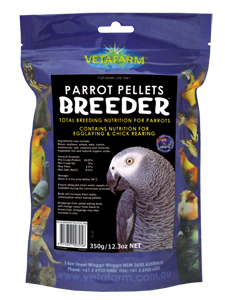 Ive found this product fantastic for sulphur crested cockatoos and galahs. Ingredients: Soybean, Corn, Wheat, Peanut meal, Vegetable oils. Minerals: calcium, cobalt, copper, iodine, iron, magnesium, manganese, phosphorus, potassium, selenium, sodium, sulphur and zinc. Available at Birdsville in 2kg and 10kg bags.